Generic Company Place Holder Rasta Monkey! Rasta Monkey, developed by Mashak Eng and published by Nitako, shows promise, but is still a few revisions away from being a must-have game. Help Rasta Monkey gather fruits for his grandpa, who wants to make nutritious shakes. A fun, cartoon-stylized game, you must take on the role of Rasta Monkey and gather fruits to help make nutritious shakes for your grandfather, General Rasta Monkey the Third. This can be accomplished by pressing down on the direction you want Rasta Monkey to go in. Holding two fingers to the touch screen to have Rasta Monkey start spinning around a branch in order to perform long leaps, which are the heart and soul of the game. Let go of the touchscreen at the right moment and Rasta Monkey will fling off in a given direction to catch the next branch and move on. It can feel difficult to get a sense of rhythm, however, and it seems far too easy to fling your character off in completely the wrong direction. The world of Rasta Monkey is appealing, with bright colors, a good frame rate — most of the time — and simple, well-rendered graphics. A bouncy reggae tune loops as a continuous backdrop, providing the game’s light, fun tone. The soundtrack is short and it loops, which makes you grateful the mute button is easily accessible. Like other iPhone and iPod touch titles on the market, Rasta Monkey features some of the better bells and whistles found on the platform. Flags can touched to function as mid-level save points within a given stage while the game itself can be paused, the sound can be muted or a stage’s objectives can be looked up via a small mini-screen present throughout the level. Other nice touches include an automatic in-game save feature that automatically saves your progress on the fly. 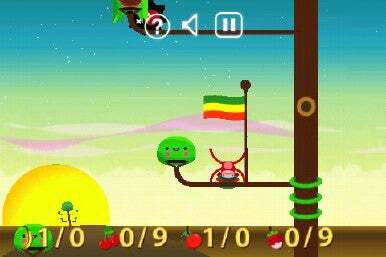 Rasta Monkey is prone to some serious errors: It stutters at times, and the character can become trapped in level terrain, which makes you have to quit the application and go back to the Home screen. When it works, Rasta Monkey is, for the most part, genuinely fun and worth playing. Still, there are rough spots to smooth over and until these bugs are fixed, your dollar might be better spent elsewhere. Rasta Monkey requires iPhone OS 2.0 or later to install and run.